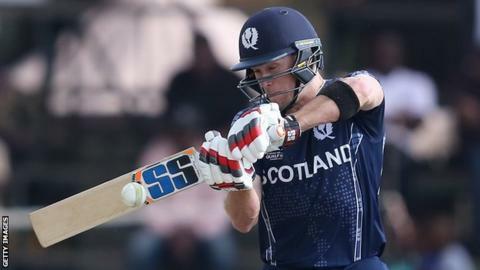 Scotland slipped to a 93-run defeat by Oman in the second game of their three-match one day series - just a day after bowling out their opponents for 24. The hosts recovered from their 10-wicket thrashing on Tuesday to post 248-8 from their 50 overs. Khurram Nawaz struck 64 from 45 balls, including three fours and five sixes, while pace bowler Safyaan Sharif took 3-60 for the tourists. In reply, Scotland were bowled out for just 155 with 10 overs remaining. The three-match series finishes on Friday. Mohammad Nadeem joint top-scored with 64 for Oman, before taking 3-38 as Scotland struggled with the bat. Richie Berrington was the top-scorer for the tourists with 37 as just five Scottish batsmen reached double figures.